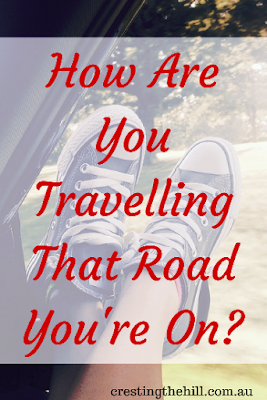 Have you noticed that life throws all sorts of challenges our way? We expect to have an easy ride, but those of us who have been around the block a few of times, know that there will be bumps along the way. Sometimes there are potholes the size of swimming pools, speed humps and "Men At Work" signs. The trick is to navigate through them. Slow down if you have to, back up a bit if need be, but continue to push on through. We build resilience and fortitude if we push through adversity. Leaving our cars parked in the garage safely doesn't open our world or extend our boundaries. It keeps us secure but life is so boring if you never venture out of that little safe haven of the garage. Everybody wants the smooth (slightly downward curving) path in life. We all want to wind down our windows, turn up the radio and feel the wind in our hair as we drive along without a care in the world. Wouldn't it be lovely if life was like that all the time? I suspect it is for a lucky few, but for the rest of us there are no guarantees about what we'll meet along the road of life. I am so grateful that I've been spared any really awful disasters in life so far. It can happen so easily - you set out without a care in the world and BANG the doctor tells you that your cough is lung cancer, or your husband confesses to an affair, or your child goes off the rails, or a grandbaby is born with a life threatening condition. There are so many huge car wrecks just waiting to happen aren't there? Perhaps we should be more grateful about the crashes we avoid, rather than worrying about the occasional pothole that throws us a little bit off course for a while. Maybe it's time to look around us at the scenery that is passing by each day and wind our windows down and take a deep breath. Maybe you'll breathe in a little bit of pollution - well that's what you get for choosing to live in the city. Maybe you'll get a whiff of cow manure - well that's part of country life isn't it? Or maybe, just maybe, you'll feel the sun on your face and some of that ozone will refresh your weary soul. We don't get to choose all the ups and downs we encounter. Some of them are consequences of the choices we make, and some are just random events. Whatever causes them, when we weather the storms of life we emerge stronger from those trials, we develop character from adversity and we can choose to appreciate that the tough times help make us the strong and resilient women we are today. I'm proud of my battle scars, I'm proud that I've come through some minor and major hiccups along life's road and I don't want to gloss over that. Let's appreciate the hurdles as they come along and learn from them and be proud of the person they've made us into, rather than complaining about the detours and the rough patches. 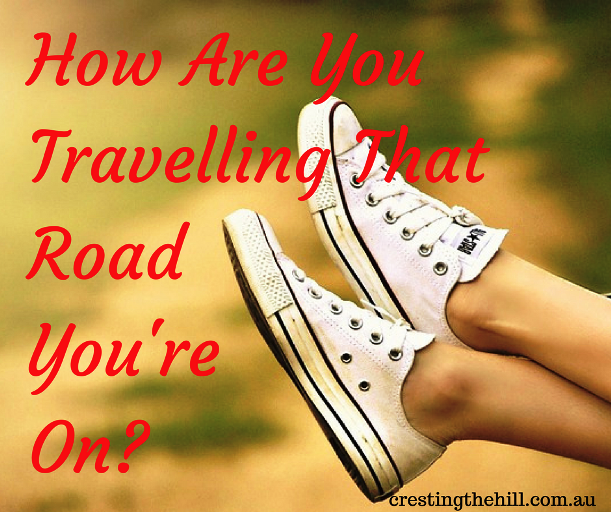 Often it's the tricky parts of life (and the road) that make living so interesting. OK I'm creating a mantra from this post and it's going to be: life is in the tricky parts. Tricky parts. The bumps and detours. I try to think of them like fear. I've made her very best friend. I need to befriend those as well. They certainly make life more interesting don't they Carla? When we start accepting them instead of trying to avoid them, life takes on a whole new look. Great post. I especially like the line: "Perhaps we should be more grateful about the crashes we avoid, rather than worrying about the occasional pothole that throws us a little bit off course for a while." Gratitude goes a long way toward making the road less bumpy! I don't think we have any idea how close we come to disaster sometimes Lisa - every crash we avoid is an answer to prayer and a blessing in itself. I've had several major crashes in my life time. The isn't a angle that doesn't have scratched paint and dents, but we're still running on all four tires...and the radio works! A smooth road is boring! So true Diane - and I am so thankful that my life is still pretty fabulous - despite the smoke and dust along the way. "Wind down" the window and breathe - yes, I often do this and it makes things much better! It's all in the breathing isn't it Antionette? If we remember to breathe and to smile and to be in the moment, then the journey is pretty wonderful. Life would be so boring without potholes and bumps in the road Leanne. We do need to 'wind down the window and breathe' more and realise that we have an inner strength that will shine forth during times of crisis. So true Sue (that rhymed!) the person we become as we navigate through the detours and the potholes, has so much more depth and fortitude than if we'd just cruised along in air-conditioned comfort. We have weathered some of life's worst storms here; I lost a daughter, have survived cancer twice, lost an eye, my husband was activated into this war at 55 and came home wounded of body and mind. Gratitude for what we have not whats been lost have kept us going. Although, that's a lot of work but like other work its been worth it. It's people like your mother-in-law (and Beth above) who leave me stunned Alana. How do they go through such terrible events (and more than one or two) and yet still find the good in life and manage to smile and be shining examples of grace? I want to be that kind of woman! It's funny, it's the potholes that send you in directions you didn't need to be in. Life in all its textures. 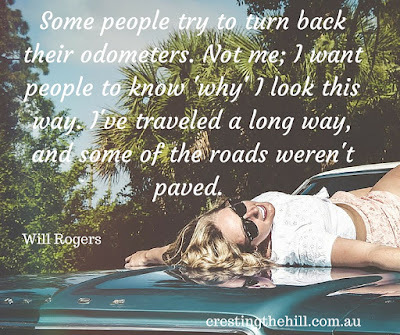 The potholes give us experiences we don't think we want Jo, but when we look back they are often the things that brought growth, and depth and even joy. Yes Leanne, life certainly does present us with a range of challenges at times. For me, these challenges usually come around the same time and I feel as though I'm on a roller coaster. Then things improve and I wonder what I was stressed about. It's important to keep a positive attitude throughout the ride. I think that's why we get to only see one day at a time Min - then (hopefully) we're prepared by the time those future events roll around. I totally get what you said about the challenges making a difference and often being a good thing at the end of it all. You're right about getting better at it as we get older Kathy. I think we realize life is getting shorter and we need to focus on the good and ride the bad stuff out until the sun shines again. Life would be boring and we'd fall asleep on the road if we didn't have the bumpy bits to wake us up from time to time. Love the winding scenic road with hills and dips to keep us on our toes.